I'm so behind on my outfits of late. 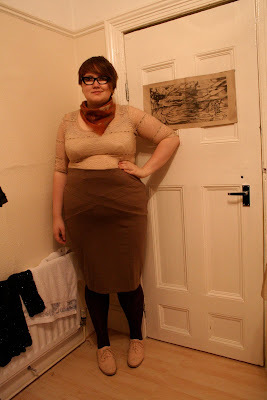 Here's one from early last week, trying the ASOS camel pencil skirt I got in the sale in a new way. Not convinced about the pale shoes/dark tights combo, but this is what happens when you get dressed at 6am! Yuck! I like this outfit and I think camel and brown shades really suits you! Hmm, I like the black/pale combo. But I know what u mean. When u look at the mirror, u don't know. There's always someone who will like it. I really, really love this! I actually think the dark tights/pale shoes combination really works and breaks up the browns perfectly. Actually it looks good. So did you change it in the course of the day? wastedfashion - no, I didn't change it, ha, I'm so lazy after getting dressed I never really change. oh dear.